Enthusiastic applause greeted Lauren Hough as she finally took her seat center stage for the press conference after the Great American $1 Million Grand Prix. Last to arrive, she had a long queue of backers and fans to hug before she could sneak away to talk about her day to the reporters. Everyone knew this is a class that Hough really wanted to win, and she and Ohlala finally topped the day on their fourth attempt. “I’ve been knocking on that door for a few years now,” she said as the applause died down. 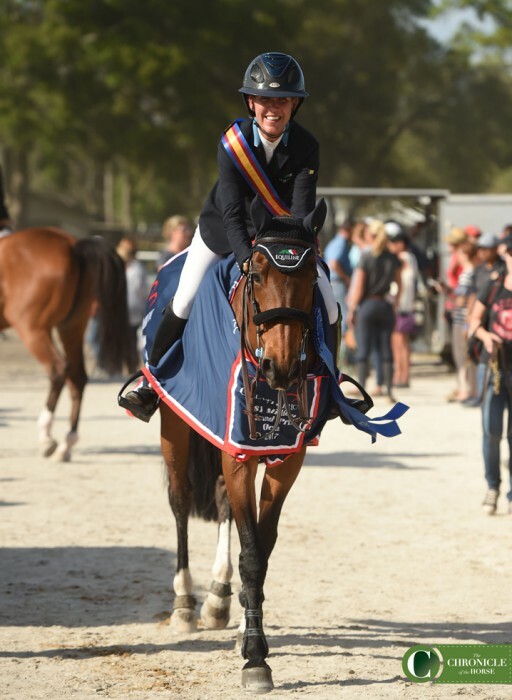 The often-serious rider had a huge grin on her face that hadn’t left since the last horse in the jump-off whizzed through the timers with 4 faults on the board, guaranteeing her and Ohlala the $350,000 top prize from the feature class of the HITS Ocala circuit. She and her longtime partner have been trying since 2014, advancing to the jump-off and finishing fourth the last two years. This time around they outran 13 other pairs on the way to the win. A starting list with both international veterans and national-level competitors gave course designer Werner Deeg a tough job, and he admitted that despite wheeling the course twice, he left a too-generous time allowed, as none of the 49 entries picked up time penalties on course. But when it came time for the short course, riders had to turn on the gas. The first few combinations faulted as they sliced a turn back to a commanding in-and-out (and Alberto Michán’s GC Chopin’s Bushi stopped short there, unseating Michán, who walked off course) and those that followed swung a touch wider to try to finish on 0. Speed demon Todd Minikus on Valenski S finished a full 2 seconds faster than Hough and Ohlala, but a rail relegated them to sixth. But perhaps the biggest heartbreak came to Mandy Porter and Milano. They just flew to Ocala from HITS Coachella (Calif.) where they won the AIG $1 Million Grand Prix two weeks ago. After a textbook first round, Milano ticked the final jump in the second round to end up seventh. Hough’s plan was to take advantage of Ohlala’s footspeed, without worrying too much about strides aboard her 15.3 hand mare. Ohlala actually tripped in front of one fence mid-course, but recovered nicely. “I went fast to the last but I didn’t take every risk. 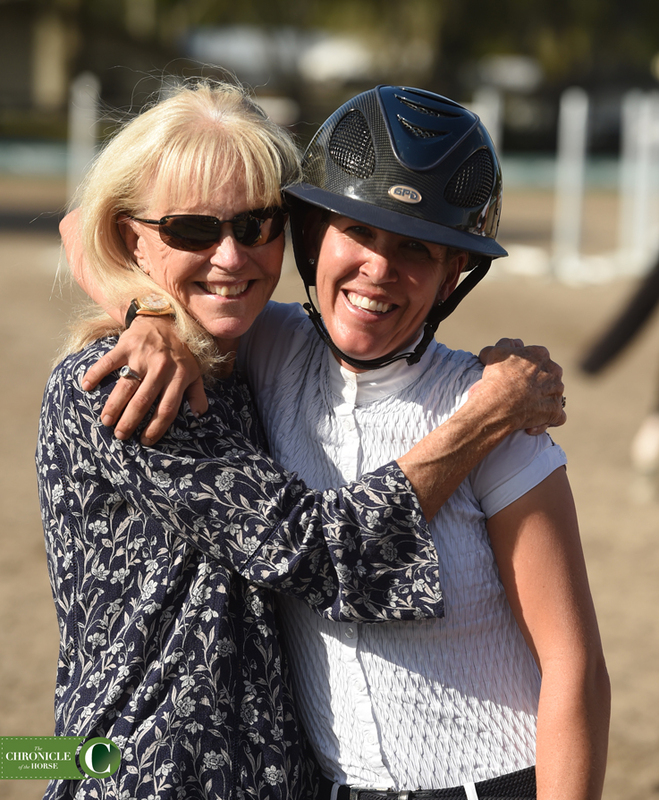 I knew Todd had gone [in 46 seconds] with one down, so I felt I had left the door open a little bit, but again, I rode what in my opinion was the fastest round I could ride today,” she said. Go Behind The Stall Door to get to know Ohlala. Local hero Aaron Vale made a valiant effort at catching Hough, galloping up the first bending line in two strides fewer than she did, but it wasn’t quite enough. He wasn’t too disappointed to finish second though. “I rode as good round as I could have. It just wasn’t quite enough today,” he said. Likewise, Andre Thieme, who’s won million dollar classes twice before, had no complaints about settling for third on Conthendrix. 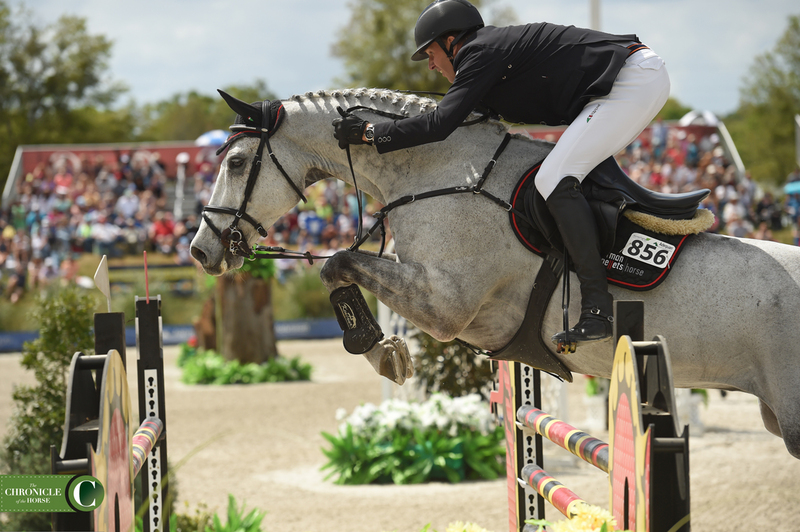 “He’s an awesome horse and I love him to death and he’s a longtime partner, but I know if the jump-off is getting really crazy fast I’m not winning,” said the German. 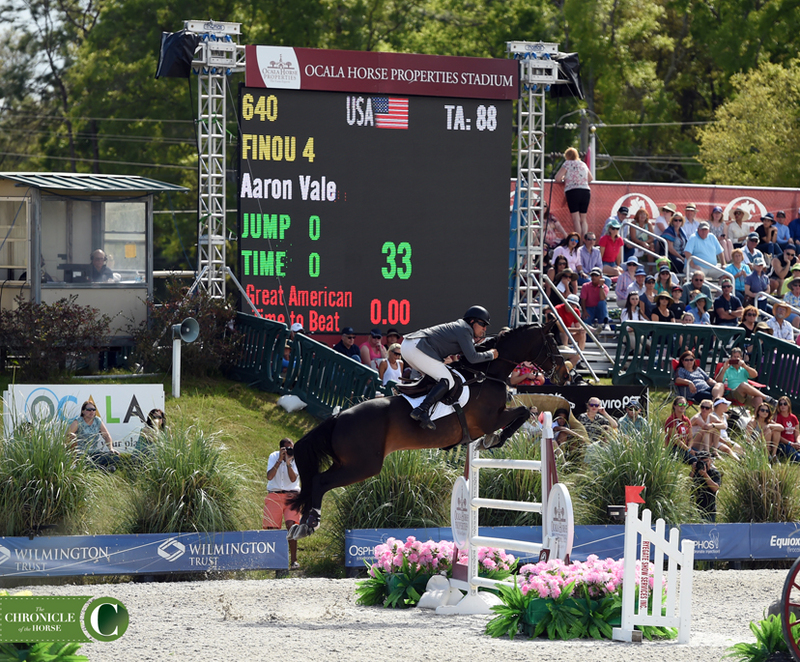 Still, the pair was quick enough to edge out Ben Maher (Don Vito) and McLain Ward (HH Callas) who logged double clean jump-off rounds and finished fourth and fifth respectively. One somber note darkened the day, as the second pair on course, Emily Moffit and For Sale 6, fell badly at the second-to-last fence in the first round, an oxer, after taking off long. For Sale 6 left the ring in a horse ambulance. Moffit walked off course. 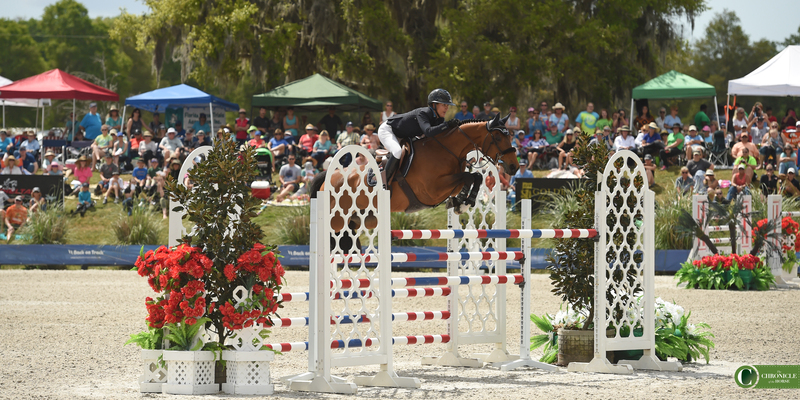 For more from HITS Ocala and the Great American $1 Million Grand Prix, check out the April 17 issue of The Chronicle of the Horse magazine. 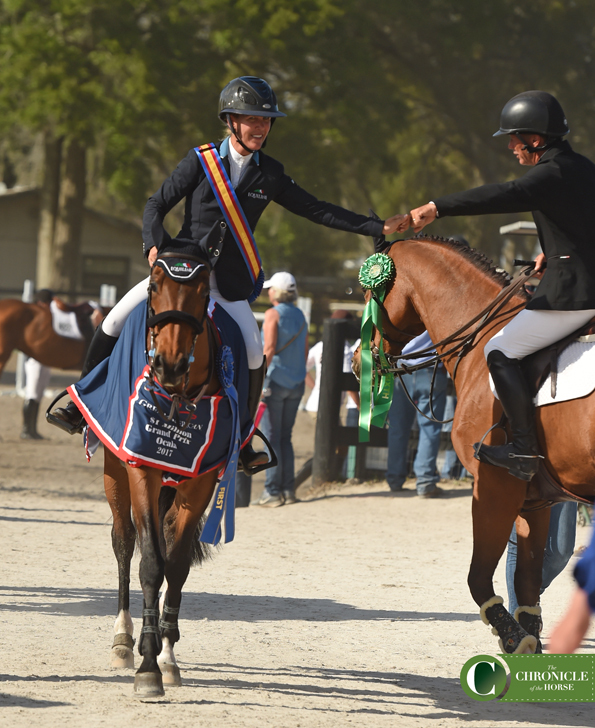 We’ve got stories about the biggest hunter and equitation classes at Ocala as well. Don’t forget to follow The Chronicle on Facebook, Twitter and Instagram at @chronofhorse.